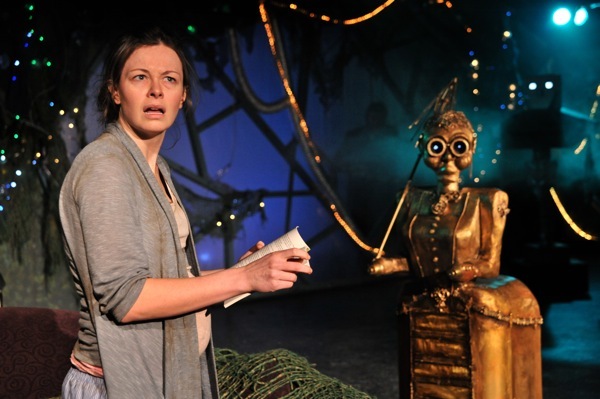 Her face says it all: Jane (Nina O’Keefe) stars as Hedda in the play-within-the-robot-play. On rare occasions do I leave a show not knowing what the hell I just witnessed, except for the fact that it was all sorts of awesome. Such is the case with Sideshow Theatre Company’s Heddatron — a funky, if flawed, one act featuring five robots performing a truncated version of Henrik Ibsen’s Hedda Gabler. Mind you, these aren’t actors in costume — the robots, who are the unmitigated stars of this show, are remote-controlled contraptions built by a group called ChiBots. They have all the personality and charm as one would expect from, well, acting robots. Five robot operators — who I think have the coolest job in town right now — sit amongst the audience navigating the robot actors around their human counterparts. It’s wicked cool. But it’s not all awesome robotics. Before these fantastical creations hijack the action, Elizabeth Meriwether’s extraordinarily bizarre work lumbers along with exposition. The biggest hurdles are the three rotating vignettes make up the first third of the play: Jane, a depressed and preggers Michigan housewife (Nina O’Keefe) happens upon the play Hedda Gabler after if the script falls from the sky; her husband (Matt Fletcher) and hot-headed brother-in-law (Andy Luther) plot to save Jane after the robots kidnap her to star as Hedda Gabler in the rainforest; and a befuddled Ibsen (Robert Koon) cringes as his bossy wife (Jennifer Mathews) yells at him. Linking all three stories together is Jane’s daughter, Nugget (Catherine Stegemann, reminiscent of Abigail Breslin in Little Miss Sunshine), who provides comically-derivative-yet-shockingly-insightful narration, as only kids can, about Ibsen and the play Hedda Gabler. So, after 30 minutes of mildly amusing dialogue and strange setup, the robots roll in, and that’s when the play’s gears really start spinning. But then, just as things get going, the robots are gone. At any rate, this is a major undertaking — both technically and artistically — for Sideshow, and the results are quite impressive. Director Jonathan L. Green has his hands full with a diverse cast, live video projections, a surprise musical number, and, of course, the robots. (Just add a dog to the mix and he’d be staging one of the most complex shows ever invented by man.) And he handles the job expertly — the piece flows about as well as one could imagine (aside from a few technical snafus at the press performance that I’m sure will work themselves out). And scenic designer Lisi Stoessel effectively establishes the many worlds that take place in this play — from a 19th century formal dining room to deep in the jungles of South America. But what’s the point of all the mayhem, motors and mechanics? I’m sure there’s something there about being trapped, rewriting life’s script, forming your own destiny, rewiring your brain, breaking free from the mechanics of fate. But who really knows. All I know is: I had a great time.